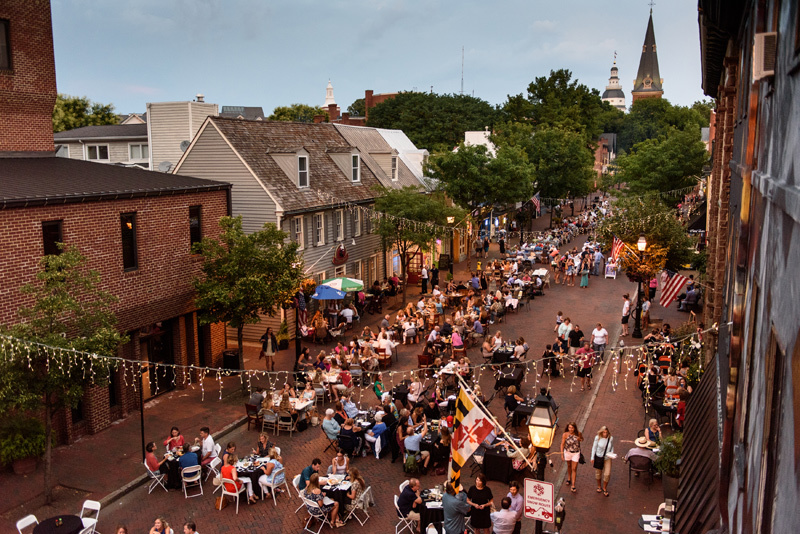 It’s 7:45 on a Wednesday evening in July, and West Street between Church Circle and Calvert Street is closed to traffic for Dining Under the Stars. This happens every week from May through October. Lights strung across the street twinkle, bringing a lovely ambiance to what is typically a thoroughfare humming with motor vehicles. Tables line the street, each served by the restaurants that populate this section of West Street. As far as the eye can see, each table is taken, filled with ladies, chic in their summer ensembles, and casually cool men. On this particular night, live Brazilian music wafts through the balmy air. The atmosphere is decidedly mellow. A gentleman in a black fedora dances a samba in time to the music. Children ride their bikes, chasing each other. Dogs laze under tables. An artist paints the scene from the front of The Annapolis Collection Gallery. Inside, owner Katherine Burke mingles with the crowd of patrons who are checking out the artwork. She is thrilled with the midweek evening interest fostered by Dining Under the Stars. It is just one of the programs that the Inner West Street Association (I.W.S.A.) sponsors to bring the public to West Street. Actually, West Street could be known as the “Street of Festivals,” because IWSA sponsors, promotes, or participates in so many of them. 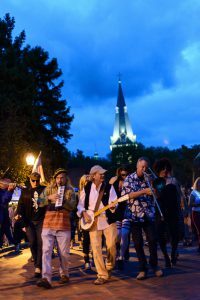 It also sponsors the Chocolate Binge Festival and the Annapolis Fringe Festival, but its most successful one is First Sunday Arts Festival. From May through November, First Sunday Arts Festival brings 130 artists and performers to this eastern border of the Annapolis Arts District each first Sunday of the month. Thousands of people attend each month, according to Erik Evans, executive director of the IWSA and the Annapolis Arts District. “Street activity is important,” states Evans. “If it’s a festival or a busker, a sidewalk cafe or a flower vendor who sits out on the sidewalk, it all just gives life to a street and makes the street feel fun and safe and comfortable to be on.” Which all makes for a vibrant community. 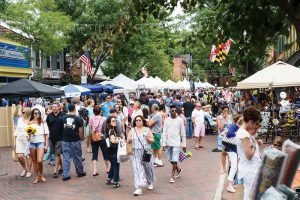 The IWSA, whose focus is planning events and activities along West Street, works closely with the state-designated Annapolis Arts District. The latter encompasses the geographic area from West Street at Calvert and Cathedral Streets to Westgate Circle—including Clay Street, the Stanton Community Center and the Compass Rose Theater—and then jumps from Maryland Hall for the Creative Arts down to the the Wiley H. Bates Legacy Center and Boys & Girls Club on Smithville Street and S. Villa Avenue. A fleet of giant chicken sculptures can be seen along West Street. Danek and his business partner Gavin Buckley sponsored them as an art project and a fun commentary about urban chicken farming. They had white chicken sculptures mass produced, and then asked artists, community groups, and schools to make them into works of art. The sculptures are popular—tourists regularly pose with them for selfies and post the images on social media. They also make West Street a fun place to be. Other “place makers” are in the works, including artisan bike racks, illuminated crosswalks, and murals. Error: Error validating access token: Session has expired on Saturday, 09-Mar-19 15:57:50 PST. The current time is Tuesday, 23-Apr-19 01:25:23 PDT.